It does not get any cuter than this hat from renowned Chicago milliners Bes-Ben, who plied their trade on Michigan Avenue from the late thirties until 1978, dressing the glossy crowns of Greta Garbo, Lana Turner and countless more with the most charming and whimsical of designs. 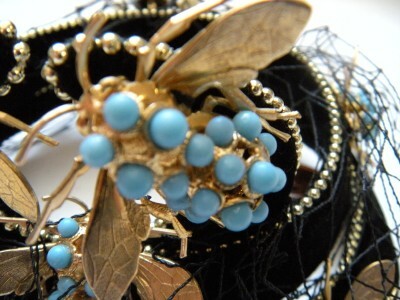 The seller of this hat has others equally lovely, and provides an excellent capsule history in the description. 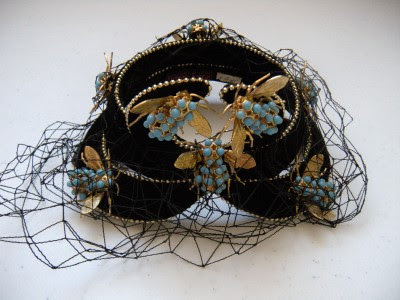 I'm not fond of insects around my head in real life, but turquoise ones caught in black net are a whole nother story. LOOK at the detailing on those wings. Just spectacular. Keep the name Bes-Ben in mind if you need a hat that will get conversation buzzing. Great tribute to Bes-Ben and their hats! This is one of the finest, stunning! Anon II: Click on the highlighted "hat" in the entry; this will direct you to the auction.